The Shoreline, the Piers & Jackson St. This was the first building on the corner of West Washington Row and Columbus Ave. 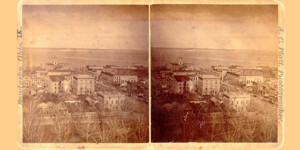 In this stereo image from the 1860’s, Cooke’s home is the two-story limestone Greek Revival house in the foreground. Image courtesy of Sandusky Library Archives Research Center. Surprisingly, this house still exists – but not here. Eleutherous Cooke came to this area in 1818, settling in Bloomingville before moving to Sandusky in 1821. In Sandusky, Cooke became the city’s first lawyer and a well-known politician. During his life Cooke and his family lived in three different homes in downtown Sandusky, the third of which was constructed on this corner in 1843-1844 when Washington Row was primarily a residential area. Cooke lived in this house until his death in 1864. 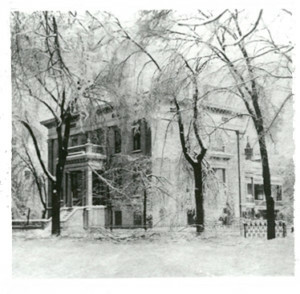 In 1878, Rush R. Sloane acquired the Cooke House to use its location for commercial development. Sloane decided, however, that the Cooke home was worth saving and hired local builder Jacob Biehl to undertake the tedious job of dismantling and reassembling it on a site south of the downtown area. For their efforts, Biehl’s crew was paid twenty-five cents an hour. Tour guides tell us that all but TWO stones found their places in the home when it was rebuilt on this site. 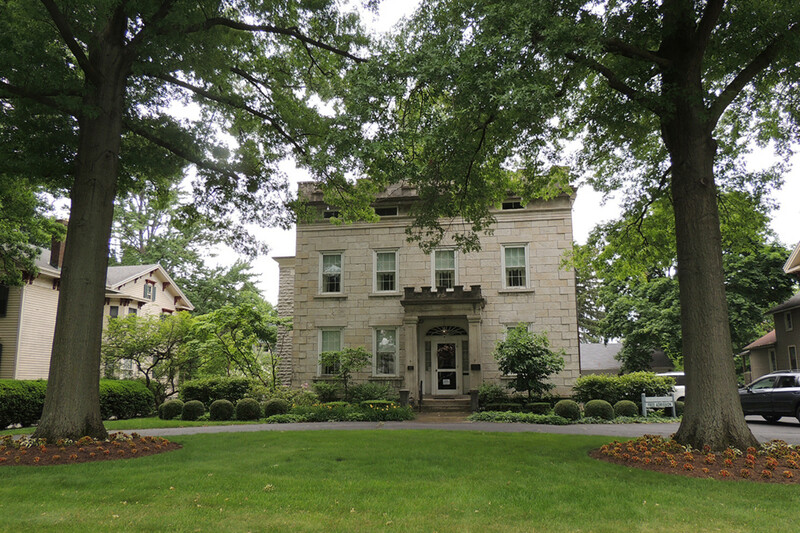 In its new location, much further south on Columbus St., the house became the residence of Rush’s son Thomas and his new wife Sarah, who was the granddaughter of Eleutherous Cooke’s oldest son. 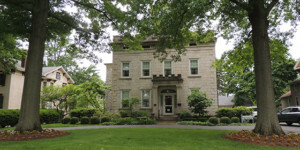 The house remained in the Sloane family until being sold in the early 1920s, and it is still standing today at 1415 Columbus Avenue operating as the Cooke-Dorn Museum . February 14, 1873 – The ‘lady killers’ rendezvous at the corner of Columbus Ave. and Washington Row, in front of the Congregational church every afternoon to ‘smash’ the girls as they come from school. November 20, 1877 – Just opened, a fine line of millinery goods, consisting of hats, feathers, tips and ornaments. Remember, we trim hats free of charge at Cohn’s cheap store, corner Columbus Avenue and Washington Street. Share History, Choose Your Platform!